You look lovely and your tree is so sweet! My tree is also in red and golden tones and I can't wait to put it up tomorrow. I always try to wait and not put it up too early, but I can't wait anymore :P Tomorrow's the day! What a beautiful outfit. I really like your boots. Yes, a Christmas tree definitely puts everyone in a Christmas mood. Decorating the tree takes a lot of work, but it is always worth it in the end. It is so great to look at your ornaments and remember certain memories attached to them! I love your list of things to do this holiday season! love the tree. so pretty. and well that necklace is so amazing. and my goodness those boots! concordo pienamente con te per quanto riguarda le "tradizioni" natalizie! fanno entrare perfettamente nell'atmosfera giusta! nice decor! looks so festive! I wish i have a little more decor to my tree.~ but I still love it regardless~ cuz i love christmas! What a beautiful xmas tree! christmas tree look beautiful!! your necklace is amazing!!!! love your tree! you look fantastic! oh amazing Christmas tree! and I love your holiday look!!!! adorable post! and cute photos! Those leopard print nails look so fierce!! Love your boots, dress, and bracelet! Such a cute holiday outfit! ...e belle le unghie...ed il bracciale...e l'anello di bulgari che adoro!!! ...se vorrai passare dal mio spazio...c'è un piccolo giveway!!! your tree is beautiful and I love the outfit. I look forward to decorating our Christmas tree every year. Is there anything better to do? Christmas is a great time of year. I love all the Winter Illuminations now in Japan. 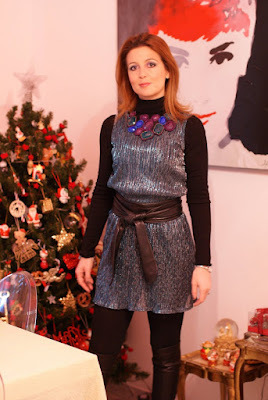 you are wearing a great combination and the christmas tree ROCKS!!! You look beautiful! Love the combo of the turtleneck and the glam dress! mi piace tantissimo il tuo vestito! e gli stivali sono stupendi! ottimo lavoro con l'albero di natale, conferisce davvero un'atmosfera natalizia spettacolare! I love your very red tree. I love your tree, it's so beautiful :). Le unghie sono davvero venute bene!!! E posso dirtelo? Il tuo alberello è delizioso! bt wat I love the most is ur hair.. so gorgeous! christmas is always fun...if you are with family and friends...nice post!!! 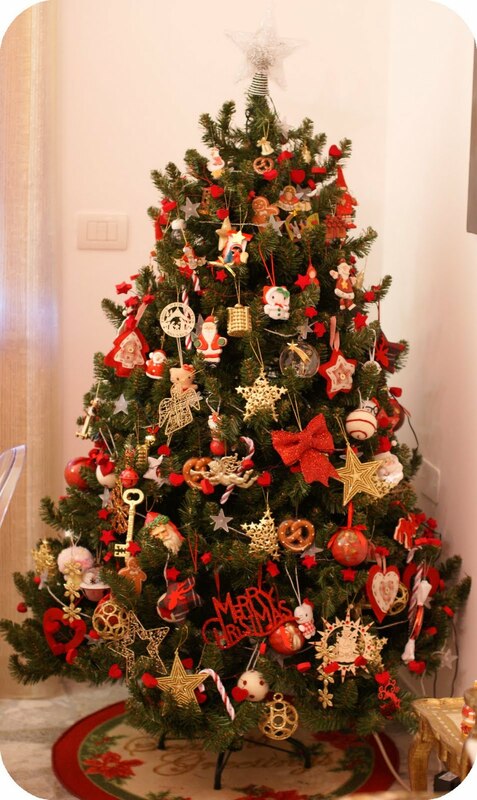 il tuo albero è bellissimo complimenti! Amazing dress!! That christmas tree is so beautiful like it! Beautiful christmas tree. I love the outfit. Your dress and boots look amazing! The bib necklace is wonderful!! You are gorgeous! Love the shimmery dress. So festive. Hey thanks for visiting my blog!!! The boots are so amazing! I decorated my christmas tree today. christmas tree looks amazing. but I also like the audrey painting.. Fare l'albero è sempre un momento speciale da condividere con amici o famiglia, un qualcosa da fare tutti insieme magari ridendo e scherzando... mi piace la tua usanza di appendere cose che hanno un significato per te - non l'ho mai fatto però la trovo una bellissima idea!! Que belissima foto!! I also have a Xtimas pic on the blog. You look great as always. 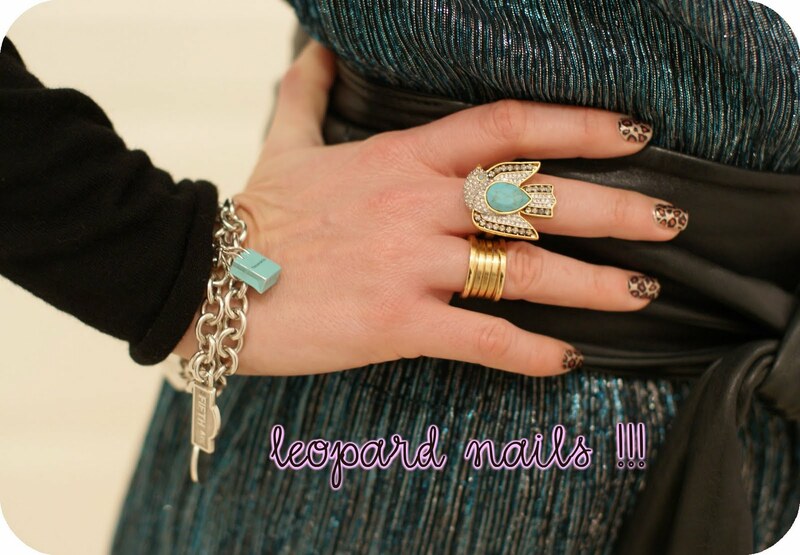 Love the leopard nails very chic! BEAUTIFUL TREE, By the way!!!! woww beautiful pictures and look. Thanks for your comments also on my blog. Following you on google friends. anche a me piace vedere film disney ed ascoltare musica. The look is also amazing! me encantan tus uñas, y las botas impresionantes! I will definitely follow you! that necklace is soooo amazinG! 1. Your Christmas tree. I think we are in the same wavelength when it comes to decorating our Christmas. I love the touch of red. have you seen my little red tree? 2. Christmas movies! Recently, I've seen Christmas with the Kranks. Love it! 5. Your necklace because it's just!!! This is so Christmas!! LoVE!!! The decor of your home is beautiful - it looks like a magazine feature. People so often overlook how much thought goes into maintaining an aesthetically pleasing home. Thank you for writing in both languages. It shows how dedicated you are to your audience and allows me to follow along. You present so many inspirational aspects in one post. I'm very happy to have found your blog. I'm most certainly a follower! PS. I would love to follow and be followed back. Get back to me, kk. ooooh che bello quel vestito in lamè! Per non parlare poi degli stivali da urlo! Che numero porti, così e li rubo hahahaha!! 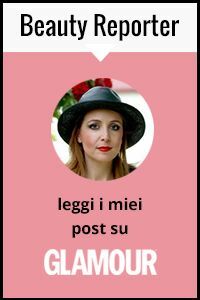 !io già ti seguo su bloglovin e se non sbaglio anche tu mi segui. 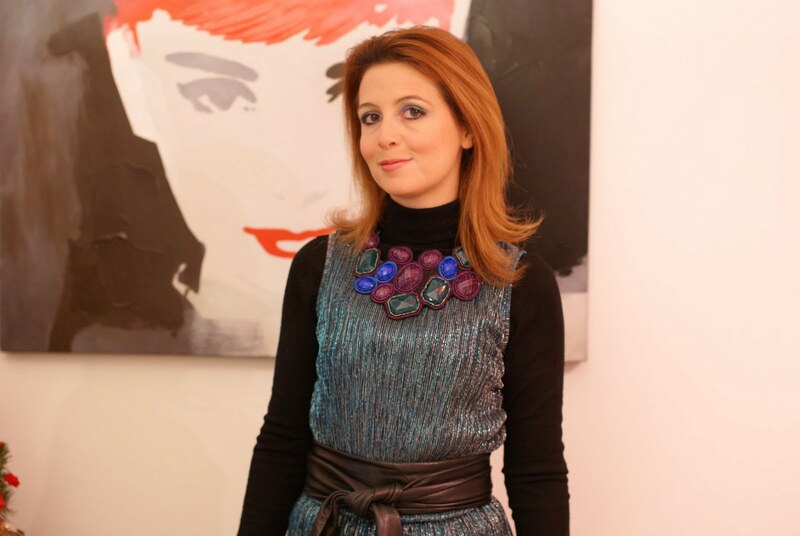 Ho messo like sulla tua pagina FB e se ti va fai altrettanto con la mia il cui link trovi nella barra di destra del mio blog. that tree looks amazing..and so do i..i followed on GFC..
Love your accessories! Your Christmas list sounds so fun. Stunning boots & I just adore that jewellery! I am so glad to have just stumbled across your lovely blog. I have signed up as your latest follower. I look forward to popping back for some more gorgeous inspiration! 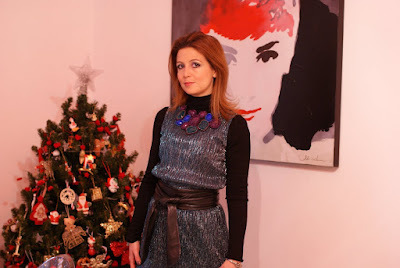 Bellissimo sia il tuo outfit che l'albero! I love the dress and necklace! And what a great list. My boyfriend and I just made eggnog and baked cookies which definitely got us in the spirit! Your christmas tree is so beautiful!! !I love your dress!